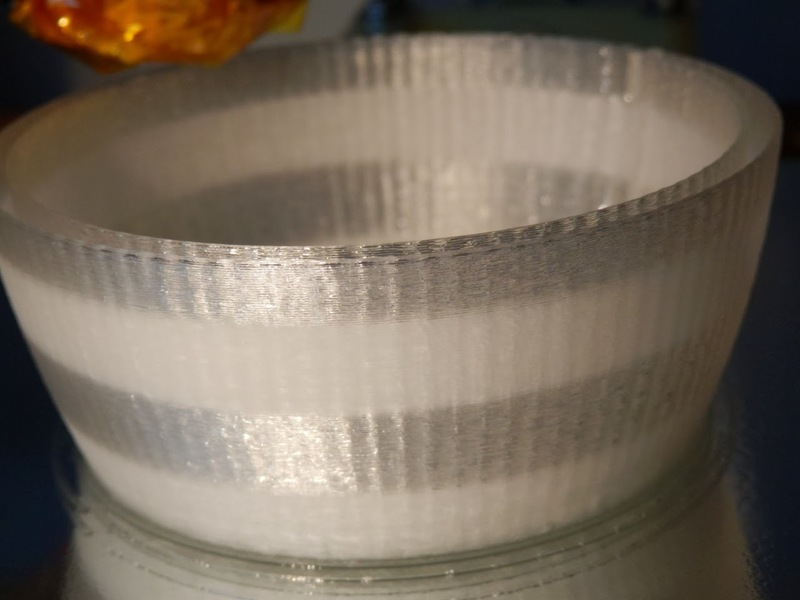 I did a little experimenting with temperature and PLA printing last April (2013) when building the Rostock - and it looks like I totally forgot to post a blog article about it! Last year when I didn't manage to get hold of any Laywood for testing, I decided to see what effect temperature had on PLA when it's printed smoothly at a controlled rate. I randomly selected Blue and Brown PLA and also used Natural (clear) as a control as I was sure that would show more obvious external differences with a change in temperature. I thought it might be neat to try a gradient effect, this is simply a change in extrusion temperature by + or - one degree C every ~3 layers over about 20 layers. This actually didn't work as I had imagined. it's better than the photo shows, the camera is not able to pick up the gradient very well and you also get a strange optical effect as you move around the object, quite interesting. 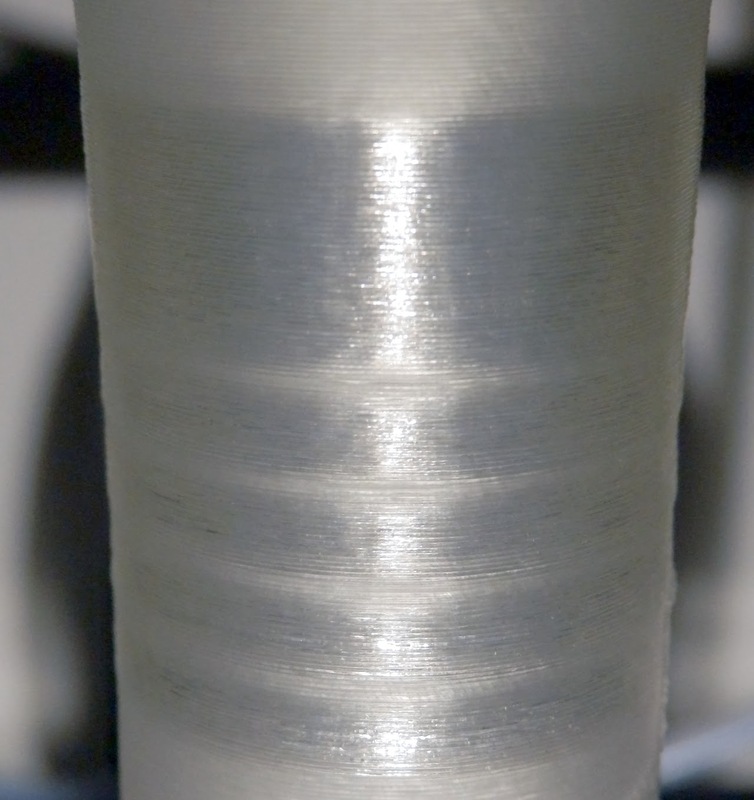 You basically get a more obvious effect with a sharp change in extrusion temperature, here above the matt bands are 190 Degrees C and the glossy are 200. The speed is also important for a good change, I found running at 80mm/sec or faster was about optimal for this PLA and a J-head MK5 Extruder nozzle. 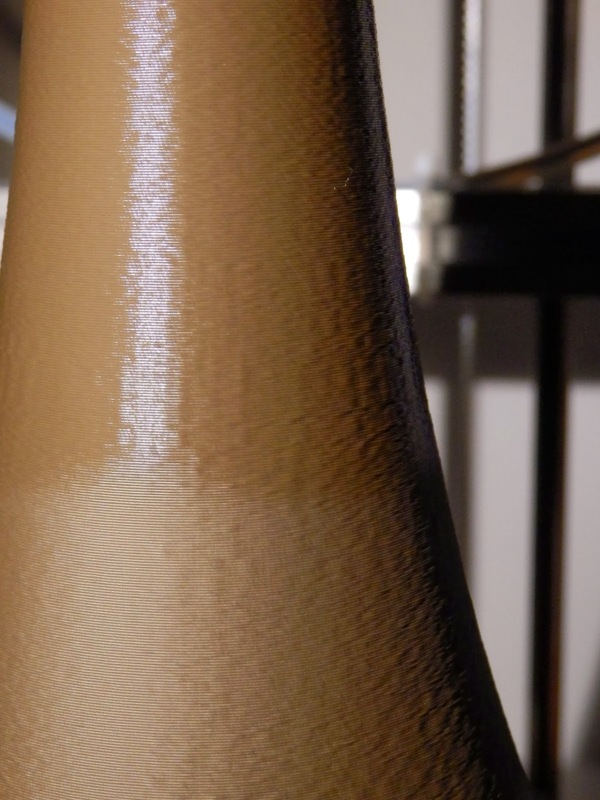 A mixture of gradual temperature change over a number of layers and sharp changes produce some really nice finishes. To help select the bands I did make a small script to post process the G-code, but sadly this seems to have gone missing from my files. If I do any more with this process I may produce a more friendly program to allow shades and stripes to be drawn on the Gcode, unless anyone else wants to produce something to do that. Purple colours also seem to work exceptionally well for this effect. I also destroyed one of these vases at the time to see if the temperature made any obvious differences to bonding strength. I could not find any difference while splitting and ripping the different temperature printed areas. 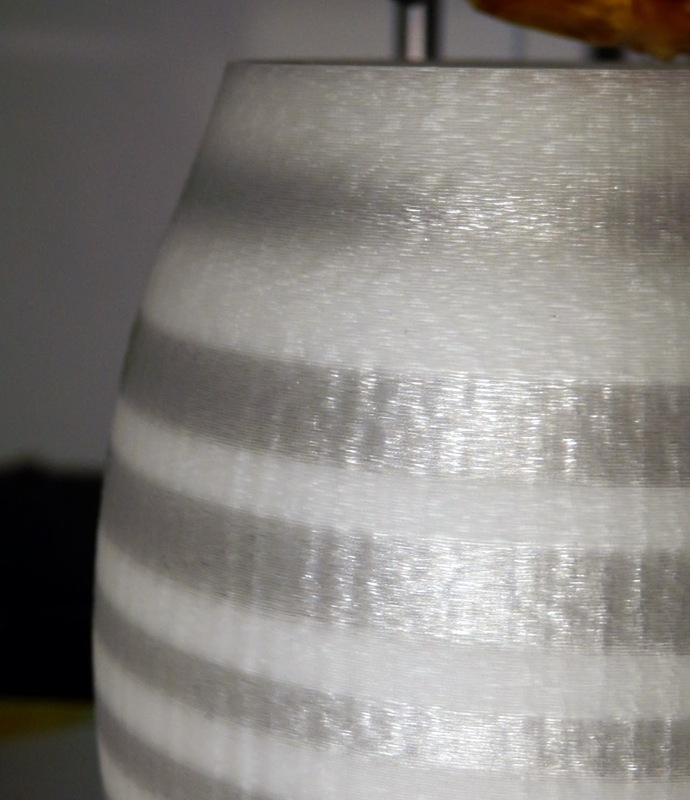 Let me know if you try anything like this, or with other materials (it obviously works well with Laywood), I'm sure other translucent PLA's and even PET (Taulman t-glase or Coloutfabb_XT) would also show this effect too. 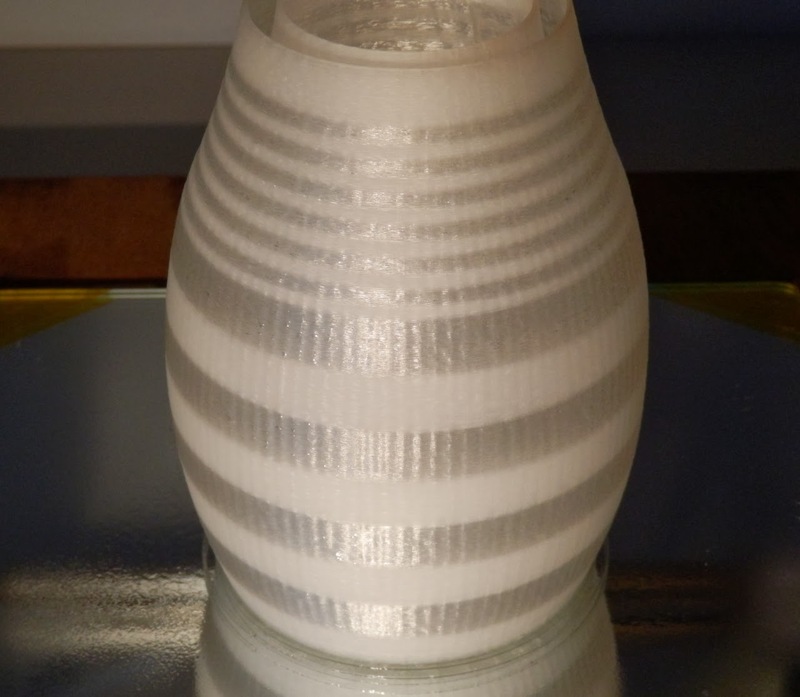 Next time I do this I'll also try out a single walled 'spiral vase' print with temperature changes, I imagine that should look very neat. Johann has done some great experiments using three force sense resistors to measure pressure applied to the build platform on a mini Kossel - RepRap Wiki page here and Johann's Blog info here. It would be neat if only one could be installed on the hot-end itself, but that's going to take a bit more work. These sensors are very simple to measure using a spare Analogue input, more info here. I'm doing another 3D printing night at Deep Space Works in Cheltenham Monday 24th March 7:00PM - if you want to come (it's all free) sign up on Meetup here - I look forward to seeing you and if you can bring a 3D printer, 3D scanner, projects etc. let Tom Howlett know via the comments on Meetup. And anything you want me to talk about or demo, leave me a comment here. 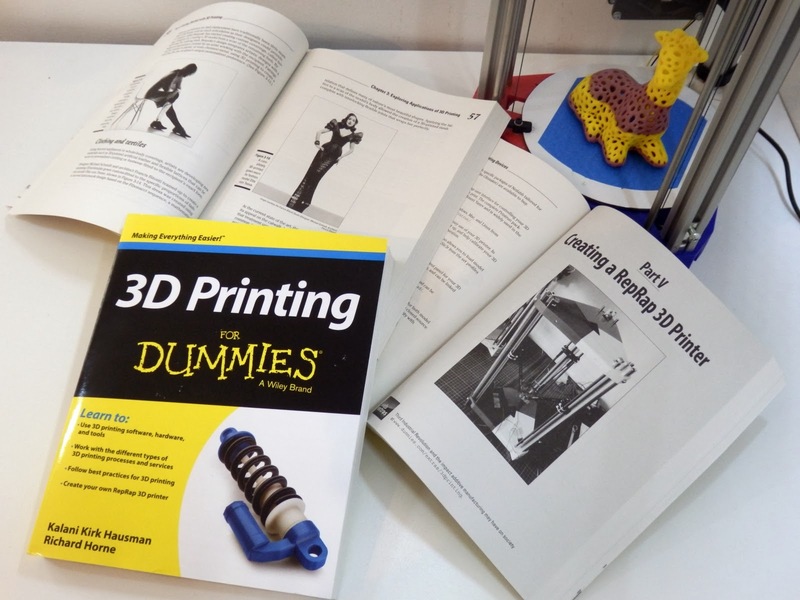 2013 review of developments, 3D Printing book release and more challenges. I missed doing my annual roundup of 3D Printing adventures before Christmas, so here it is, with some plans and updates for 2014. Firstly thanks for reading this blog and to all the wonderful people who contacted me in 2013, I believe this year is going to be the best yet for 3D Printing, stay tuned and do get in contact if you have something to share or a project collaboration idea. My 2013 year of 3D printing development started with a pledge to be my year of ‘yes’, wherever possible I planned to say ‘yes’ and get as involved as I could manage (with time available). This led to trying out many new things including speaking at various shows, festivals, events and even on the BBC website and World Service about 3D printing. I'm working on new designs, prototypes and ideas. Collaborating with different people and always looking out for other 3D printing projects and experiments too, do keep in contact and let me know what you are up to too. One of the real highlights of 2013 was the experience of writing a book. It’s always been on my lifetime achievement list, and it feels really good to now be a published Author, I really hope to do more as the experience really was exhilarating from start to finish, something I will never forget. It was a real privilege to be part of this book, and I was very lucky that my co-author Kalani Kirk Hausman had already put in so much work to get the project off-the-ground with the world famous publishers Wiley – so when the chance to contribute to this project came about it was a very easy ‘yes!’. We had a short timescale for the 300+ Page multi-chapter book, and it had to cover a wide range of 3D printing aspects. The book covers some of the 30 year history of an already well established additive manufacturing industry, and looks at the current and future uses for this technology. Many people and fantastic developments have helped to make this book a reality, I want to thank everyone involved in the project and all who kindly allowed images to be used for the book. 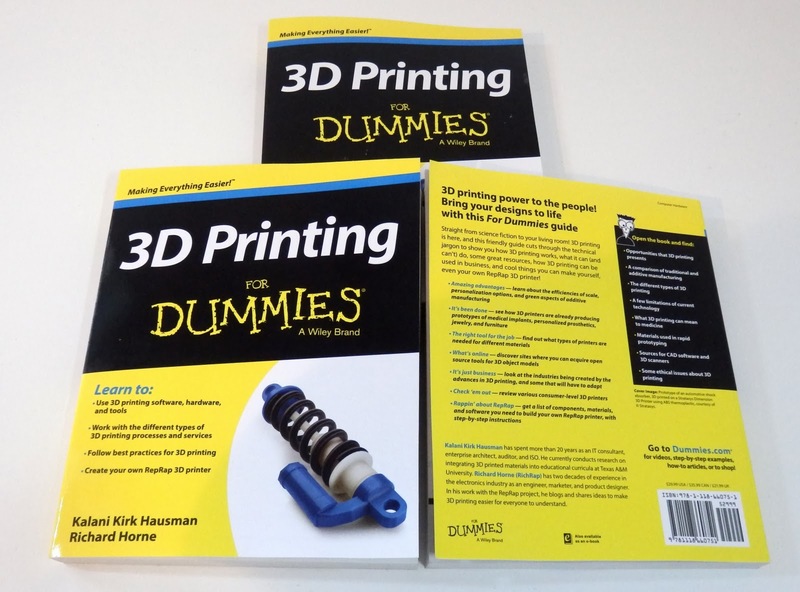 You can take a look at the Dummies guide to 3D printing book on Amazon now, it’s available in either print or eBook, and various translations are planned. If you do get a chance to read it, Kirk and I would love to know what you thought. Another interesting aspect was a flurry of 3D printing writing activity from many different people who contacted me during 2013; asking for image permissions in their own books, some are also now released and some ongoing with releases this year. I’m sure much more will be written on the subject, it’s such an amazing technology that will some day impact and benefit the lives of everyone. I'm sure plenty more will be out soon. On that note, I also finished reading MAKERS by Cory Doctorow ( @doctorow ) again over Christmas, it's now available for free or donation download in many formats here. A fantastic story (it's fiction, not history, but will be :) for anyone living and breathing the 3Dprinting and the fabulous Maker movement. I highly recommend reading it. I have not added as much as I wanted to RichRap.com some of this was due to the already heavy level of traffic on it, it’s about to blow another bandwidth limit so at some point this year I will fix that, update and add more tutorials and content. In the mean time I also plan to get shorter but more frequent blog posts up on here, some while I do developments rather than a massive post at the end. 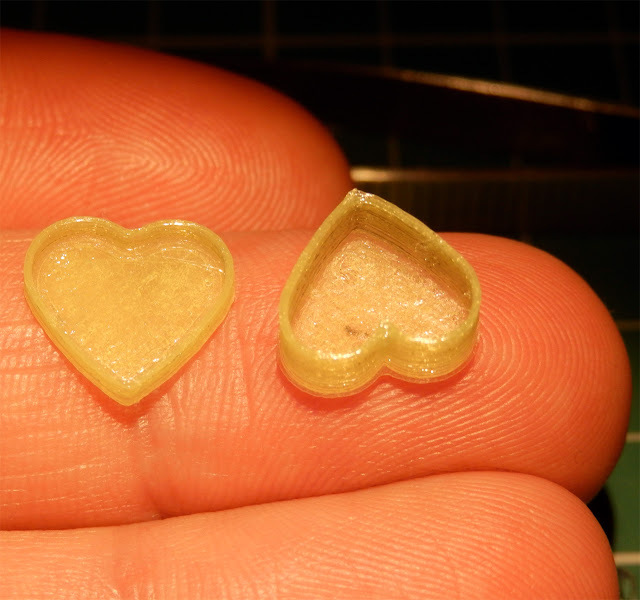 Printing small was a lot of fun, it taught me a lot about 3D Printing and how best to control plastic extrusion, when to use heat and when to cool, more information here. The RepRap Magazing was launched, this is again another great project by people in the community to document and give a wider voice for all things RepRap. - We would like to do and release more issues in 2014. My Nylon printing and colouring experiments attracted a lot of attention, this was a lot of fun and very much still something I continue to experiment with. I plan to do a follow-up article later this year about Nylon, mixed materials and further colour experiments. 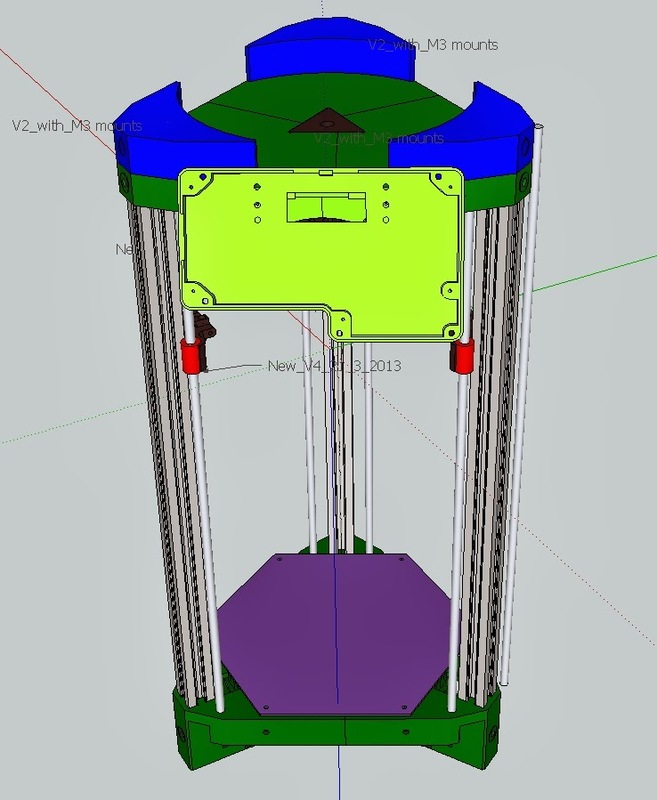 I have always planned to release a RepRap 3D printer, and after a frantic 5 week development during the earlier part of 2013, I had the first 3DR ready for testing. For me 3DR has been amazing to watch as it goes out into the world as my take on a 3D printed Delta, watching it then evolve into something much more is great. Releasing 3DR as an open-source project occupied a lot more time than I had expected last year, but it also led to some really great conversations with people and lots of other great things. You initially think that releasing everything and seeing what people do with it would allow more time to work on other things. That was not the case, it's as much work as if you released it for sale or started a company. 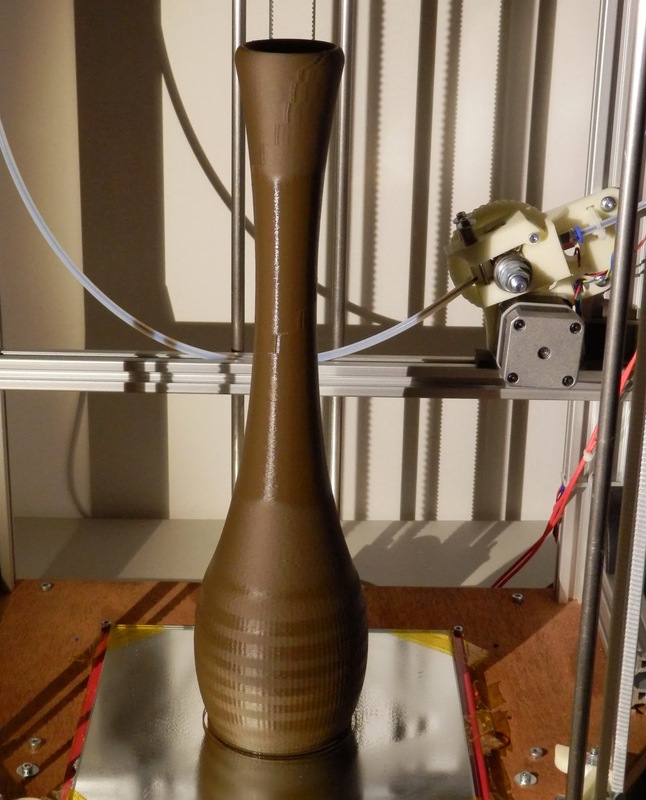 For me the starting point into the delta geometry was the Rostock, this was a great printer to build and allowed a lot of experimentation, especially with tall prints that had not been possible before. The Open Hand project by Joel Gibbard was a fantastic project to see come into life, and with healthy backing the project is well underway. Joel also won the Venturefest award for best newcomer. Congratulations again, and best wishes from me for the ongoing project. IndiGoGo perks shipped out and hand-designs well under way. 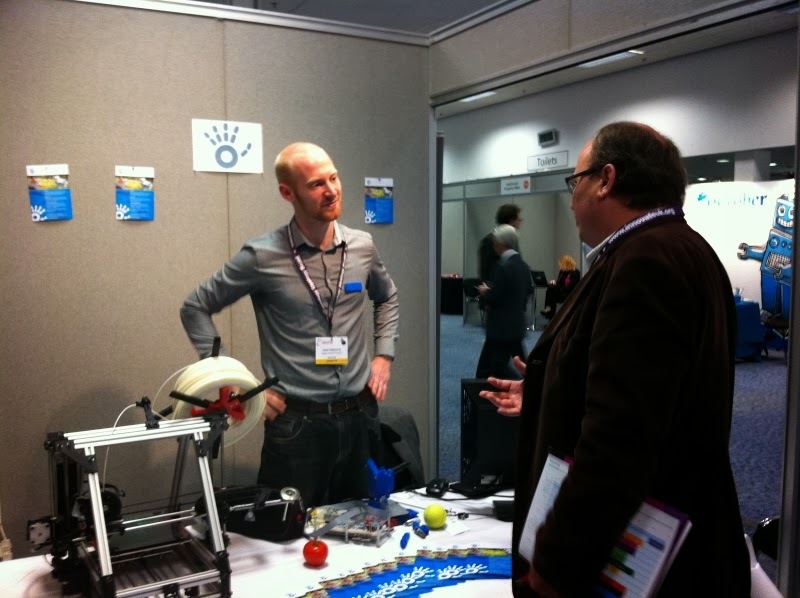 The London Makerfaire, London 3D printshow and TCT Shows were another great highlight of 2013, we have more great things planned for shows this year, TCT is moving to a 3 Day event and will be bigger and better than ever. 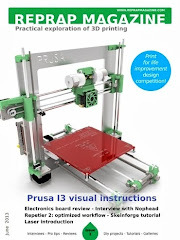 We are starting to see many different 3D printing associations and 'standards' being setup, so I was delighted when the 3D printing association asked me to be a member of the board of advisers, we are aiming to promote, guide and advise as many people as possible with 3D printing and all forms of additive manufacturing. 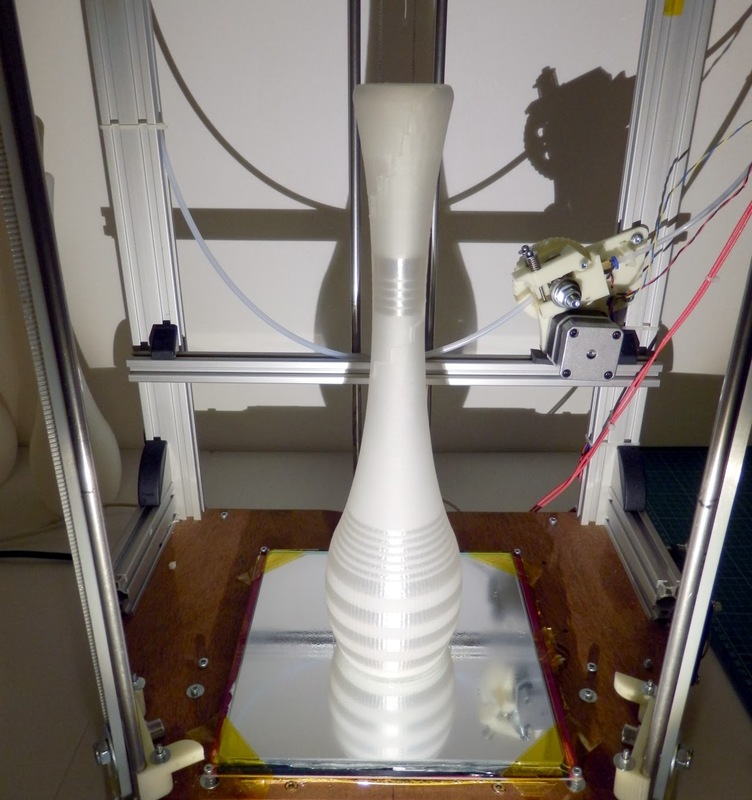 News and dedicated 3D printing websites boomed in 2013 and will continue to grow and mature with both content and advice. 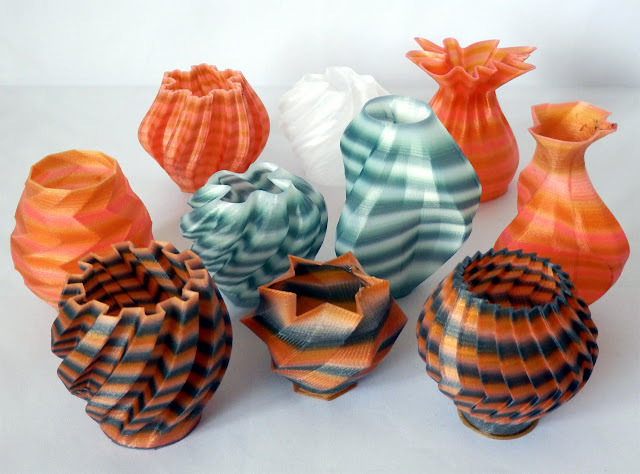 It's almost hard to ignore 3D printing now and it's also very apparent, that many people are starting to be aware this technology is becoming useful for small businesses, and at a justifiable cost level. 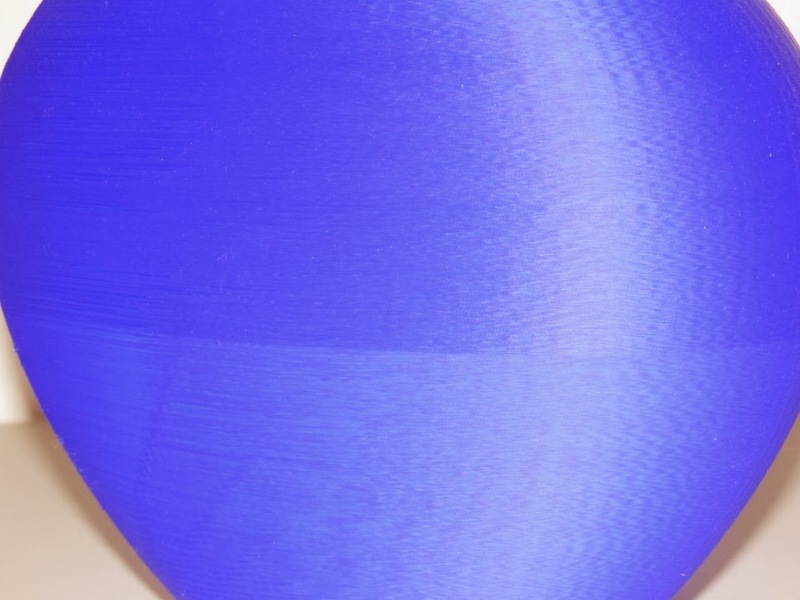 My go-to news sites for 3D printing news are the 3DPrintingIndustry who I also try to write interesting articles for as time allows, most recently I posted one on filament recycling (tech for trade). And another is 3DERS.org - an entire website with news and everything you can imagine to do with 3D printing, it's amazing what and how fast they pick up 3DP news and PR. We have also seen sharing sites grow and evolve. There are far too many to mention now, but one I have used and will continue with is the Excellent Youmagine (by the Ultimaker team). Kickstarter and IndieGoGo both had a huge number of 3D printing and associated projects up for funding. As usual time and other work got in the way of all the other things I wanted to experiment with and do, my list of projects and ideas grows bigger every month, but I still managed to design and do a lot of things over Christmas, I'll get up blog posts and images as soon as I can on these and future planned work, if any of you want to collaborate on any projects or innovation, do get in contact. Lots more to share soon. It's going to be a very interesting year indeed. Nils posted some great predictions by a few in the 3D printing community, lets see how many happen or disappear. And for inspiration it's world #InventorsDay - go invent something... anything.